I'm trying to build RDW in EDH (1v1, start at 30 life, so the deck is actually viable). The deck plays only burn spells and efficient red creatures, capping off the curve at 5 with cards like Demigod of Revenge, Balefire Liege (my inspiration for making this deck), etc. The General is 5 colors so I can play all the hybrid cards. My question is, pre-Invasion, what sorts of good burn spells or efficient red creatures are there? Also, any efficient draw power in the artifact/red section are also welcomed as suggestions. I've included Wheel of Fortune and Wheel of Fate. I'm a bit iffy about letting other players draw extra cards as well, so if there are any splashable blue draw spells, please suggest them too. I've already included Stroke of Genius. Avatar of Fury. Even though it's supposed to be RDW I still think the opponent will hit 7 lands most games, since you'll probably have to aim some burn spells at their threats rather than their dome. Maybe the Viashino creatures that have haste and get bounced EOT? Viashino Cutthroat and Sandstalker. I think you are thinking specifically of Fireblast from Alliances. You sac two mountains for the cost, not pitch a red card to do 4 to creature or player as an insant. Cave In from Mercadian Masques is a pitch-a-red to do 2-to-non-flyers-and-players. Flameshot does 3 divided-as-you-choose at the cost of discarding a mountain from your hand; it's from Prophecy. Chain Lightning is also good - it is a sorcery speed Lightning Bolt that has an obvious drawback in the mirror but little else. Jackal pup and Goblin Cadets are older common RDW one drops, as is Cursed Scroll, Grim Lavamancer, and Seal of Fire and Rishdan Port (a land). Tangle Wire gets used at times to steal tempo. Viashino Heretic is a nice way to control artifacts in a body. Black Vise is cruel beatings. Ball Lightning is key, as are Lightning Bolt, Chain Lightning, and Fireblast. Other than that, there is very little in the way of 'efficient' creatures. Old Sligh decks ran Ironclaw Orcs for christ sake. Jackal Pup, Mogg Fanatic, Hammer of Bogardan. Rolling Thunder is a fun one. Last edited by latrodectus55 on 2008-Sep-07 12:39 pm, edited 1 time in total. Thread moved to dueling strategy forum. I would prefer the more flexible burn...stuff that can hit creatures and/or players. I guess in some cases if it means getting more dmg out of your burn spells or removing a pesky blocker then I could use some of those creature-only or player-only burn. Version 1 is with barely any old cards thus I started this thread. Will update it with older cards to Version 2 soon. Turn 6 Furnace of Rath, Slith Firewalker, attack for 30. I understand that you want to be able to play all of the cool hybrid cards, but I think you're severely limiting yourself by taking a five colour general. Having access to a general is sooo powerful. Look at it this way; even if your general is nothing special to your deck, just a regular creature (yeah right), ignoring your general is like forcing yourself to mulligan once every game (at the very least)! Zo-Zu the Punisher is pretty great, for a Sligh style deck. Fumiko the Lowblood isn't quite like Threaten every turn, but she does get the blockers out of the way very effectively. Jaya Ballard helps immesurably, if you get mana-flooded (especially against blue decks). Having her as a general lets you keep a healthy mana-base without fear. Kiki-Jiki has millions of amazing applications, even in mono red. If you really want to keep Balefire Liege in your deck, go Boros Deck Wins. Neither Brion Stoutarm nor Agrus Kos are half bad in aggro. If you add a third colour, you have your pick from any 6/6 flier for 6. Flamebreak is a really good sligh-style card. It lets you eliminate Weenies once you've run yours out and they've died, as well as hitting players. Sulfurous Blast is good for the same reason. Arc Slogger seems like it could be a good finisher. But none of these cards are pre-Invasion. Limiting myself to mono-red is way too harsh since the hybrids provide much better firepower. I am able to play the Lieges (altho I only run 3...not running the UR one). Guildmages become playable (I'm looking at you, Rakdos!!). Demigod of Revenge and Boggart Ram-Gang are in-your-face-right-now damage that you otherwise won't get if your deck is straight red. 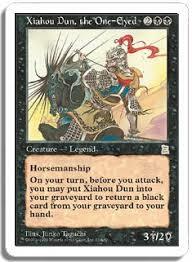 Even Vexing Shusher played a vital role in screwing around with the opponent. Brion Stoutarm as General would probably be the best idea except that I want to keep the mana base mono-colored for consistency's sake (can't afford duals). Use basic lands + Journeyer's Kite and Thawing Glaciers. Also, running artifacts allows you to pop in Shrapnel Blast if you're going for some high-power burn. ...and to no one's surprise, my deck scrubs out to enchantments. I just lost a match to a Zur the Enchanter player. Game 1 Pillory of the Sleepeless stopped a Figure of Destiny and Copy Enchantment (copying Pillory) stopped Thunderblust. Demigod of Revenge got a couple games in and I played Rise of the Hobgoblins for 2 goblins. Nobilis of War was going to make an appearance next turn...except he played Propaganda. Game 2 a turn 2 Slith Firewalker and a bunch of 2-mana 2/2s go all the way. Game 3 I got stuck on 3 lands and lost horribly. I don't think I am going to find a way to deal with enchantments. Makes me lose the aggro by devoting slots to other spells and forces me to play a non-budget mana base...all I did was add in more lands, upping the count to 38. Boros deck wins or BDW?